In Defense of Joseph: What Is Truth? According to RLDS Doctrine and Covenants 90:4b (LDS D&C 94:24-25), “truth is knowledge of things as they are, and as they were, and as they are to come; and whatsoever is more or less than this, is the spirit of that wicked one, who was a liar from the beginning.” In my opinion, this is the most accurate definition of truth I have ever read. When we see things for what they really were, really are, really will be, we see the “truth, the whole truth, and nothing but the truth, so help me God.” And anything different than this is a lie. Recently, I have been following the blogs of Alan Rock Waterman, Why I’m Abandoning Polygamy and Why Mormon History Is Not What They Say. If you have not read them, I suggest you do. They are excellent presentations of his discovery that Joseph Smith, Jr. may not have promoted or practiced polygamy and his view that mainstream history on this issue may need to be revised to support that finding. In other words, all the spin, all the hype, and all the interpretation needs to be peeled away from this issue to get down to just the facts. What has impressed me is his keen grasp that noted historians of LDS polygamy have omitted numerous documents by Joseph and other primary witnesses that Joseph did not teach or practice polygamy. I have always felt that any biography of Joseph dealing with the issue of polygamy which does not adequately consider his stand against it and does not consider the findings in the Temple Lot Case and does not consider the statements of his family who knew him best, is either suspect in its motives or just poor history. How can we get to the truth (“knowledge of things as they are, and as they were”) without considering all documents pertinent to this issue? My hat is off to Mr. Waterman for considering a shift in his thinking to the possibility that Joseph was telling the truth and for his eloquent and tireless defense of his position. Since the basis for his shifting paradigm is the book Joseph Smith Fought Polygamy by Richard and Pamela Price, some of his responders commented that the Price’s association with the RLDS Church and their firm belief that Joseph was not a polygamist has tainted the information. In addition, some indicated that the quality of their work is suspect because their educational degrees in history are not sufficient to write credible history. When I was a young man, I heard a minister state in a sermon, “It doesn’t matter who is right. What matters is ‘what is right.’” In other words, truth is truth, no matter who speaks it or writes it. This principle has guided me in my life to accept the truth whether it is my idea or someone else’s or whether it comes from the most learned and degreed person or the simplest one. “Truth is knowledge of things as they are, and as they were, and as they are to come” regardless of where, or with whom, it originates. This principle has allowed me in my personal, professional, and religious relationships to cut through the “I’m right—No, I’m right” communication barrier to get to the heart, or truth, of the issue. Even though the Prices do not have doctorate degrees in history and are associated with the fundamentalist part of the RLDS Church and believe with all their hearts that Joseph was not a polygamist, the principle indicated above allows one to look at the evidence on its own merit. Knowing the Prices, this is exactly what they want to happen. And this is what Mr. Waterman has done. He has looked at the evidence presented and decided it merits consideration, regardless from where it came. If the mystery of Joseph and polygamy is to be unraveled, then those who are unraveling it must look for the “truth, the whole truth, and nothing but the truth” regardless of who is presenting it. Joseph Smith Fought Polygamy is far from being completed. While the first volume is in print, the complete work to date (about 2 2/3 volumes) is online. However, the Prices have indicated there is enough documentation for four to five volumes. Thus, they believe Joseph did not teach or practice polygamy because the volumes of documentation, which they are working to make available to the public, support that position. Joseph Smith Fought Polygamy is not a biography of Joseph. It is, as the title states, documentation showing the extent of Joseph’s fight against polygamy. All of the biographies about him that deal with the polygamy issue indicate he lied about his involvement in polygamy and do not attempt to show otherwise. It is easy to conclude he lied if you do not show he stood against it. The purpose of Joseph Smith Fought Polygamy is to let Joseph defend himself by his actions and his statements. It is to present the evidence which other writers have omitted. It is to show that in spite of all the allegations made against him, Joseph stood firm against the teaching and practice of polygamy. When this work is completed, the reader will have to judge for themselves. Did Joseph lie about practicing polygamy? Or, do the volumes of evidence supporting his actions and statements against practicing it necessitate the alternative conclusion that, in fact, Joseph Smith fought polygamy? Excellent piece of work, Defender. Your contention that truth is truth no matter the source is a concise reflection of my own thoughts and I only wish I had put it that succinctly. Thanks very much for the high praise. Like you, I'm just trying to find out the truth. Well done. Thanks, Rock, for the kind words. I recently watched a youtube presentation on why Utah LDS members are leaving the church for reasons other than what people assume (Rock knows full well what I'm talking about since he's the one who linked the presentation on his blog in the first place), but what really bugged me while watching it was how the guy presented the argument that Joseph practiced polygamy as fact. It really didn't come to a boil until this little spiel- paraphrased, "When church members learned that Joseph had many wives despite preaching against plural marriage, his response was, 'I never said I was perfect, get over it.'" If this was really true, then that one statement would have undone everything Joseph had gone through in regards to the 116 lost pages, the trials at Zion's camp, Liberty Jail, and every single time he'd been rebuked by the Lord. It destroys every example he had shown as a credible leader and, based on other examples in his life, I simply cannot believe he'd say something like that to wash his hands of lying, especially when he translated the verse of, "Woe unto the liars for they are thrust down to hell." "Thrust" is the key word there because to be "cast" into hell simply implies being tossed into a pit and letting free-fall take over from there. "Thrust" implies that a force is pushing one down all the way to the bottom as fast as possible. Upon thinking about this further, I came to the conclusion of, if Joseph indeed never practiced plural marriage, just how much later church leaders had completely sold him out in order to justify their taking of plural wives. It's hard to put into words, but it definitely gives people a reason to undermine Joseph completely and knock the entire foundation of the church out from below. No wonder Rock said along the lines of, "What better tool could Satan use to try and destroy the restored church?" Sài Gòn ồn ào náo nhiệt giữa thành phố phồn hoa này tìm một không gian yên tĩnh, thư giãn giúp bạn được thả lỏng người tận hưởng khoản khắc yên bình. Thì không quá khó không vì hiện nay có nhiều không gian quán cafe yên tĩnh tại sài gòn với cafe đẹp sài gòn được mọi người biết đến với không gian ấm cúng tạo cảm giác gần gũi thân quen.Chắc hẳn sẽ là sự lựa chọn hoàn hảo cho bạn. Hôm nay chúng tôi công ty tư vấn thiết kế nội thất giúp bạn chọn lựa không gian thiết kế quán cafe phù hợp với xu hướng hiện nay. Thanks for your comment. I watched the video myself when Rock posted it, but evidently the “I’m not perfect” statement slipped past me. I agree with you that such a statement seems to be out of character for Joseph and his understanding of the importance of obedience to the laws of God. In fact, even if one believes LDS D&C 132 was given by Joseph, which I don’t, the statement is still inconsistent with the tone and substance of that section. I believe Mormons today are in a very precarious position regarding their belief about Joseph and polygamy. If they believe he taught and practiced it, they have to also acknowledge he lied about it. And if he lied about it, how do they get around the possibility that he also lied about all the rest—the vision in the grove, the Book of Mormon, the revelations in the D&C, the Inspired Version, etc.? However, if they believe he was telling the truth, their belief in the truth of the restoration is still intact, but the validity of the Mormon Church from Brigham Young to the present is in question. This is a very difficult position to be in and I admire anyone who is willing to honestly pursue the truth about it. I believe Joseph was not a polygamist. And I believe if a person honestly and prayerfully seeks the truth about it, the Lord will confirm this to them. And when He does, He will also show them what to do about it. I first found out about Joseph Smith's apparent multiple marriages and couldn't even face researching it, but I did get on my knees and pray and was asked, did I believe in Joseph Smith, I did, Did I believe in the Book of Mormon? I did! As long as I knew these details, everything else would fall into place. That was in 2004, and the last week I plucked up the courage to face my fears and research all the accusations. I was SHOCKED with what I found out! I read the apparent diary of William Clayton, it was so tampered with, no-one could possibly take it seriously! There were contradictions galore! I checked out the Journals of Discourses! Boy o boy Brigham Young's teachings were completely opposite to Joseph Smith's! I read the newspaper articles from the time of Joseph Smith, within the LDS church we DO NOT read the same history! The history has been tampered with. I am gob-smacked at the distortions and that Joseph Smith relentlessly pled his innocence, but his words are not recorded in the LDS history! He consistently spoke out against polygamy. I have read so much of Joseph's ACTUAL words now, that the forgeries stand out as sore thumbs. I cannot believe how so many people are fooled by the lies. My other comments are, anything that has gone through the hands of the LDS church or polygamy apologists is to be doubted! Brigham Young had 30+ years to perfect all those records/gain false affidavits and use dead people as back-ups! It is as if the name JC Bennett has been changed for the name Joseph Smith. To add to all of that, my testimony comes through prayer and the answer I received was that Joseph was married to one woman and that was Emma, and that Brigham young was an apostate and led people away. The truth will be known!! Thank you so much for your comments and testimony. It gives me great joy to know the Lord is working to make the truth known about Joseph. Stay strong in your belief about Joseph’s innocence. We had a discussion on the validity of the church from Brigham Young on back at Pure Mormonism. When John the Baptist restored the priesthood to Joseph and Oliver, one of the promises they were given was that the priesthood would never again be taken from the earth. If you look at the difference between priesthood power and priesthood authority, even an unworthy holder can invoke the authority of the priesthood and pass it to other people, even if their unworthiness causes them to have no power behind it. However several priesthood ordinances require only the authority, so thus even men who are wicked in one sense can still pass the priesthood on to a successor. Even then, that doesn't fully clear up the claim of Brigham being considered Joseph's successor when, as you've stated in other essays here, Joseph named his son Joseph III as his successor. My apologies for taking so long to reply, but it’s been a busy week. Coming from an RLDS background, my perspective about priesthood power and authority is a little different. For us, both the power and authority of priesthood is dependent upon the priesthood member’s faith and righteousness. God calls men to the priesthood because of their preparation and the work He needs them to do for Him. When a man is ordained to the priesthood, he receives the authority from God to represent him in performing the duties of his office. Both the continuation of his authority and the extent of the spiritual power by which he performs his priesthood duties comes from his faith and righteousness. A priesthood member whose faith and righteous is like that of Enoch or Melchizedek exercises the full authority and power of his priesthood. A priesthood member who has mediocre faith and who is good, but not righteous, still has authority from God to perform his duties, but he does so with less spiritual power than he would have if he had great faith and righteousness. However, a priesthood member who falls into unbelief and wickedness looses the spiritual power to perform his duties and eventually, if he chooses not to repent, he also loses his authority to represent God. To illustrate this principle, let me give an everyday example. Let’s say I own a business with several employees. Those employees represent me and my business in the duties they perform in that business. If an employee performs their job poorly, I fire them. And thus, they lose both the power to perform their job duties and the authority to represent me and my business. So it is with God. Priesthood members work for God representing Him and His business, which is “to bring to pass the immortality and eternal life of man.” If they do that job poorly enough by falling into unbelief and wickedness, God will take away not only the power of the priesthood but also the authority to represent Him. It is also my understanding that the authority of priesthood is given by God, not man. Man does not pass it on, but God passes it on through him. If God recognizes the authority of the one ordaining, He grants the authority to the one being ordained. But if the one ordaining no longer has authority from God, God does not recognize the ordination and does not grant authority to the one being ordained. So, from my perspective, laying aside all the successor issues, if Brigham Young and the other eight apostles were the promoters of polygamy and Joseph was not, Brigham and those apostles lost both power and authority to represent God in His priesthood. This would have prevented God from passing the authority of priesthood through them. If we do not recognize that God removes both power and authority from unrepentant, disobedient priesthood, then the Pope of the Catholic Church still has authority through Jesus Christ and His apostles to represent God on earth. And if this is so, there was no need for God to have restored His true Church to the earth in 1830. But we know this is not true. 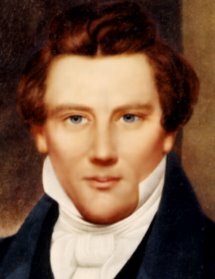 God had to restore His Church through Joseph Smith, Jr. because both the power and authority of priesthood had been taken from the earth through unbelief and wickedness. Thus, the beginning of the Restoration Movement is its own testimony that both the authority and power of priesthood is contingent upon the faithfulness and obedience of its members. Thanks so much for your comments. I always look forward to hearing from you. I can definitely see your point and for the moment I just have to say, "I don't know," when it comes to trying to sort it out for sure. The main reason behind my own theory is the fact that my priesthood line of authority progresses through Brigham Young and I've exercised the power and authority several times in my own life to the point where I've come to believe that, even if the church falls away, I can still have a testimony of the gospel and the priesthood. Even if I don't figure everything out I just have to remember that God works in mysterious ways and just have to do what I can while keeping faith in Him while things will fall into place down the road. I certainly agree that God does work in mysterious ways and all we can do is our best in being faithful to Him. I believe the Lord has honored your service to Him, as He has honored mine, by the presence of His Spirit. I believe His Spirit honors all, both inside and outside the Restoration Movement, who seek to serve Him in righteousness and in truth. Nevertheless, and I can only speak for myself, while the Spirit has greatly blessed me in the performance of my priesthood duties, these spiritual blessings do not nearly equate with those received by early Saints in the Restoration Movement. I could be wrong, but I do not believe that any of the churches today with roots in the Restoration Movement are even coming close to exhibiting the spiritual manifestations of the early church. Without the full manifestation of the Holy Spirit through the power of the priesthood, it is very difficult to discern the authority of priesthood. Largely, but not completely, I feel that God has withdrawn His Spirit from the Restoration Movement. And in my church, it is because of our collective unbelief and unrighteousness due to the liberal movement that has become the Community of Christ. However, like you, I believe everything will fall into place. I firmly believe that God, as promised, will build His Kingdom Zion. To do that, I believe He will set in order His Church with the full power of His Spirit and the full power and authority of His priesthood. And to that Church and Kingdom He will gather in all who wish to serve Him in righteousness and in truth. This is my hope and it is what keeps me going. Note that Launius does not seem to question the assumption of something almost like a 'worship of pure will in and of itself'. Because if 'truth is dead' then the only way for Launius is to proceed, akin to Neitzche, to just 'make it up as you go', to mold the world by arrogating to oneself the authority previously thought to be invested in truth. Interesting stuff, no? Even more interesting, Launius seems to attempt to preemptively undermine any possibility of being able to "argue" about his assertions-disguised-as-nonassertions. This is what happens, I would submit, when a vacuum (even a partial vacuum) is left when the Spirit withdraws after, as it were, encountering persistent rebuffs. The only thing left to take its place is pure, unadulterated 'leadership'. To me, at least, the leadership exercised by the COC heirarchy often seems to bear a resemblance to the type of leadership that has been lampooned in the comic strip "Dilbert". And it also seems to me that by reading Launius' article, one may get a sense of the unhesitating use of techniques that look uncomfortably like "confusionismo" in order to develop an aggressive strain of leadership which can be used to inoculate "followers" against doubting doubt itself. "Oh brave new world, etc. etc." JS defender, I know this is off the thread but I didn't know where else I could post a question so I am going to ask it here. How do you reconcile or refute others when they bring up the scripture in D&C 5 about JS "pretending to no other gift" and they are quoting from Book of Commandments not a 1835 version or later? Sorry for the delay in response. I've been quite busy and unable to attend to this blog as I should have. Unfortunately, I'm not very knowledgeable in the area of "The Book of Commandments vs. The Doctrine and Covenants." I will do some research on this topic and get back to you on your question. I do appreciate your asking. Again, apologies for a delayed response. Thank you for your post. I found it most interesting. I came across a Review Paper on a Polygamy Book. It mentions Prices book as well. It's got some great points & confirms even more strongly to me of Joseph's innocense. Well worth the read. Thanks for your comment. When Nauvoo Polygamy by George D. Smith was first published, I purchased a copy and began reading it. However, after a couple of chapters, I gave up. It was obvious to me that the author was just making things up about Joseph. Awhile later, I stumbled upon the FARMS review of the book that you posted. I was delighted to find that it confirmed my belief about the book. While the author of the review states his belief that Joseph was a polygamist, he does an excellent job of exposing the fraudulent approach of this book including the misrepresentation of Price’s position in Joseph Smith Fought Polygamy. Like you, I was very pleased to see that the review writer was making an honest attempt to expose the truth. It’s interesting to note that it was Nauvoo Polygamy that started me thinking about the “New Attack on Joseph.” When I connected George D. Smith, Signature Books, and the RLDS (CofC) liberals associated with the John Whitmer Historical Association, I began to see there has been a combined effort between the liberal Mormons and the liberal RLDS over the last 20 to 30 years to discredit Joseph’s good name. It was this realization, plus the fact that very few were defending Joseph on the Internet, that made me start this blog. Take care. Be strong in defending Joseph and the truth of His Gospel. The most beautiful part of the Lord’s work is yet to come.